SHE has more than 40-years of experience implementing student-centered learning in medicine and the health sciences. SHE covers the full educational spectrum. Our courses are designed to innovate health professions education. We therefore offer a full range from short courses to certificate courses, to full degree programmes. Students are free to participate on campus or via one of our distance learning formats. Our distance learning is comprised of module and case-based, interactive activities that you can access (on demand). We currently offer multimedia-enriched, comprehensive, and interactive courses. 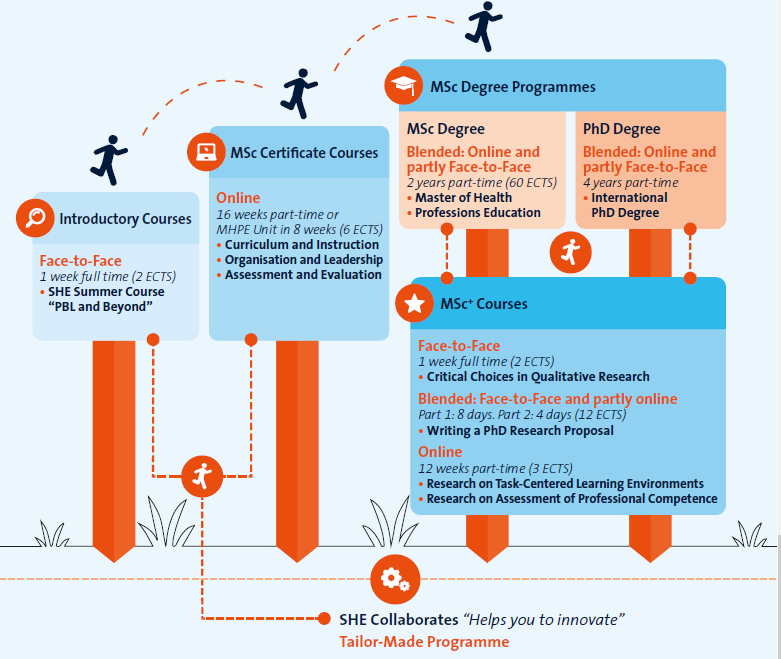 The degree programmes are largely distance-based, all in order to provide maximum flexibility for combining learning and work. Often courses are stacked, as learners become engaged in the health professions education domain. If you wish, we can offer you customized programs, either in Maastricht or at your own institution. Our short and advanced programmes are relevant to teachers, educators, managers, curriculum developers, decision-makers or any other professionals interested in the field of education. The certificate Courses and degree programmes provide scientific training in educational theory and its application to education practice. These specific courses are open to professionals from the health training sector, persons working in health care or individuals who wish to become involved in one of these two areas, and who have the relevant university or equivalent backgrounds. The University of Maastricht has a proven track record in PBL. Our training programmes are ranked highly at the national level and our educators are highly regarded in the field of medical education. Alumni have benefited greatly in their career from our training programmes. We hope you will too. Summer Course, "PBL and Beyond"